Kate Miles sold her first wedding dress at age 12. Vancouver Fashion Week is well underway and with so many talented designers bustling around the city, it would be easy to get lost in the fray. Fifteen-year-old designer Kate Miles, however, is having no trouble making her mark in Vancouver. She was invited to Fashion Week after winning Portland Fashion Week's Emerging Designer contest. On Monday night, she debuted a show-stopping green and ivory haute couture gown at VFW's opening gala — a milestone in her career. But Miles' journey as a designer goes back to growing up on a farm in Oregon, two hours from the nearest city. She created her first dress at the age of six. When Miles was 10, her father was killed in a farming accident, she told The Huffington Post B.C. in an interview Wednesday. She and her mom moved closer to Portland, giving Miles more access to fabric stores. Eventually, she began to sew more and more. At 12 years old, Miles sold her first wedding dress. However, having raw talent doesn't always get you a free ride. An invite to Vancouver Fashion Week doesn't include the cost of hiring models, makeup artists, and hairstylists. The promising businesswoman, who's still rocking braces, also got a little help along the way. When that wasn't enough to cover costs, Miles made some big sacrifices. In the end, Miles made it to Vancouver and she says it’s been worth every penny. “It’s incredible. In high school, kids are always judging me, saying ‘Why don’t you play sports? Why don’t you want to hang out at the mall? Why are you wasting all your time sewing?’” she said. 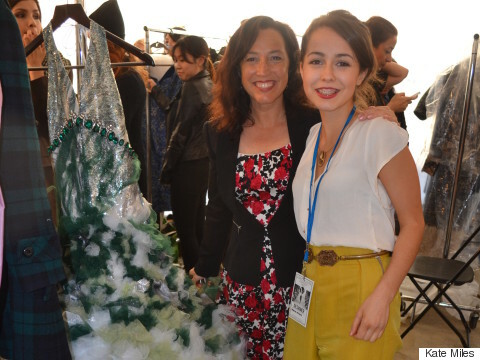 Kate Miles (right) poses for a photo with her mother before her Vancouver Fashion Week debut on March 16, 2015. The appearance at the VFW opening gala was just the start. Miles also showed her couture bridal collection on the Vancouver runway — something that still hasn't fully sunk in. Outside of fashion, Miles is a high school student — who is taking advantage of a program that allows her to also study at the local community college. She’s on track to graduate with her associate’s degree and high school diploma by the end of her Grade 11 year. Upon her double graduation, Miles says she hopes to go to art school — maybe even somewhere north of the border.